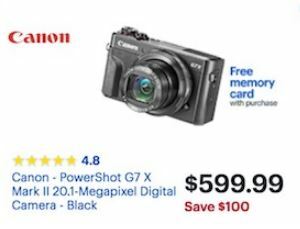 Find the best Canon Camera Deals over Black Friday and Cyber Monday 2019. 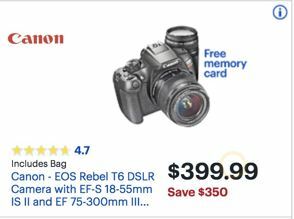 Get tremendous savings and discounts on the Canon Rebel T7i, M-series mirrorless cameras, and the top of the line full frame cameras. 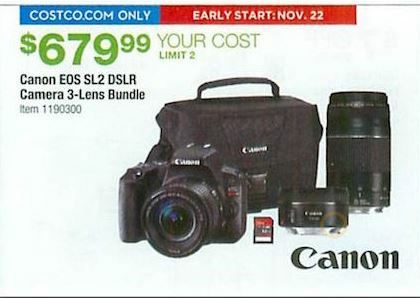 Below you will find a list of some of the Canon cameras that we will be tracking for Black Friday 2019. EOS-1D X Mark II – Canon’s full frame, 20MP flagship camera released in 2016 to replace the EOS-1D X. It can capture 4K video and shoot continuously at up to 16 fps. 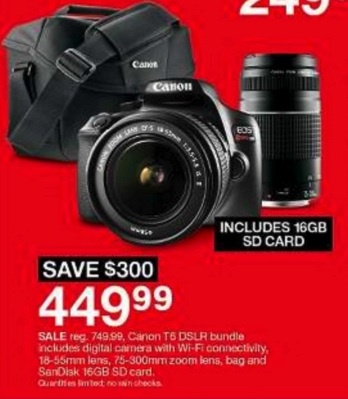 Canon EOS 5DS – A 50.6 megapixel, full-frame camera with a 61-point high density reticular autofocus system for high-resolution digital photography. It was released by Canon in 2015. 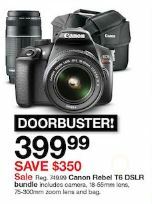 EOS 5D Mark II and Mark III – The Mark III is a 22 MP full-frame sensor released in 2012 to replace the 21MP 2008 5D Mark II. EOS 6D and 6D Mark II – The EOS 6D is Canon’s five year old entry level full-frame camera. The Canon EOS 6D Mark II is the new model, with a 26.2 megapixel CMOS sensor and Digic 7 Image Processor. EOS 7D Mark II – A digital SLR for artistic photographers and videographers. 20.2 megapixel CMOS sensor with Dual Digic 6 image processors. Full HD recording at 60p. 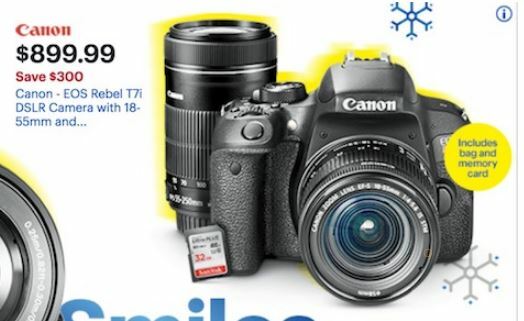 Canon EOS 77D – Canon’s 2017 camera for advanced enthusiast photographers who wish to take the next step with their equipment. It replaced the 80D. EOS 80D – The 2016 successor to the 70D for the photography enthusiast. It has a 24 megapixel sensor and a DIGIC 6 processor. EOS 70D – A 20.2 megapixel camera that was replaced by the 80D. Canon EOS Rebel T7i – Canon’s 2017 overhaul of its entry-level DSLR includes a 24.2 megapixel CMOS (APS-C) sensor, 45-point all cross-type autofocus system, and optical viewfinder. It is called the EOS 800D outside of the United States. It has the latest processor, revised sensor, expanded ISO range, revised autofocus system, faster flash sync speed, full HD recording to 60p, increased battery life and more. 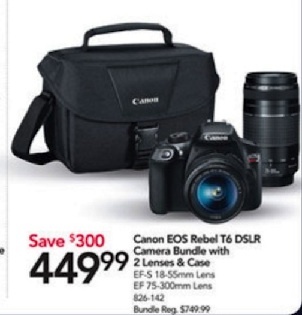 Canon EOS Rebel T6i – This two year old camera with a 24.2MP sensor is known for its high-quality, crystal-clear photos. Rebel T6s – Similar to the T6i with a top-mounted LCD panel, a control dial on the back for instant exposure-compensation and HDR video at 1280 x 720. 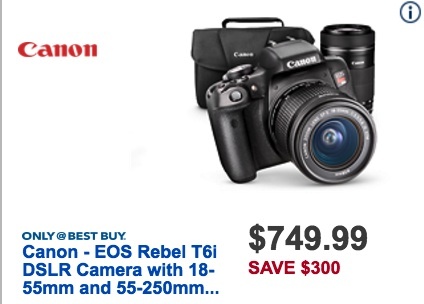 Rebel T6 – An affordable, 18 megapixel camera that is a step down from the Rebel T6i. 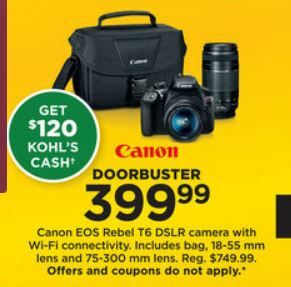 Kohls will have a doorbuster Canon EOS Rebel T6 DSLR camera with 18-55mm lens, 75-300mm lens, bag, and $135 in Kohl’s cash for $449.99 (regularly priced at $749.99). This is the Canon mirrorless camera line. Canon EOS M10 – A lightweight and compact design with 18M resolution and the versatility of interchangeable lenses. 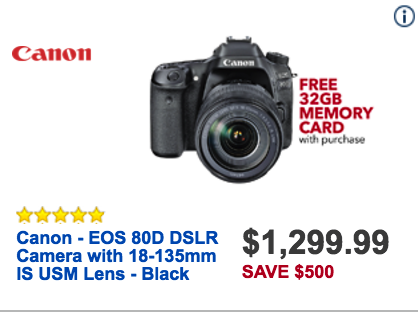 This was previously the entry-level version of Canon’s mirrorless cameras. Canon EOS M100 – A compact and easy-to-use interchangeable lens mirrorless camera released in 2017. If you are looking to upgrade from smartphone photography, this is a decent option. Canon EOS M3 – One step up from the M10, it has a 24.2 MP CMOS sensor in a compact body. Canon EOS M6 – A compact 24 MP mirrorless, interchangeable-lens digital camera with the newer Dual Pixel CMOS sensor than the M3. Powershot G7 X Mark II – A premium, compact camera with speed and performance via the 20.1 megapixel resolution and the Digic 7 processor. PowerShot G9 X and G9 X Mark II – The G9 X Mark II is an ultra slim pocket camera with 20.1 megapixel CMOS sensor and Digic 7 Image Processor. PowerShot G1 X Mark II, G3 X and G5X – The G5 X was the first G-series camera to have a full-featured 2.36 million dot electronic viewfinder. The G3 X is a premium compact camera with a longer zoom range and tilting LCD screen. The G1 X Mark II is a high-end compact with the quality of a DSLR in a small, fixed lens body. 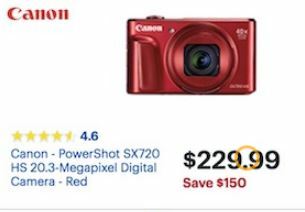 PowerShot SX610 and SX620 – The SX620 has a longer battery life, faster lens, and longer telephoto lens (25-625mm) than its more affordable predecessor, the SX610. Both have a 20MP 1/2.3″ sensor and serve as a versatile, high quality, reasonably priced point and shoot. Powershot SX530 HS and SX540 HS – The SX530 has 16 megapixel resolution and 24-1200 telephoto zoom lens. The SX540 HS has 20 megapixel resolution and DIGIC 6 processor, with more advanced technology but a higher price than the SX530. 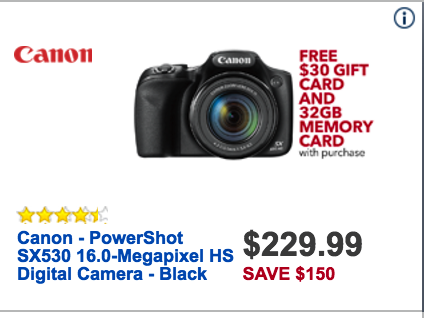 PowerShot SX420 IS – A 20 MP digital camera with a 42x optical zoom lens that serves as a budget family camera. 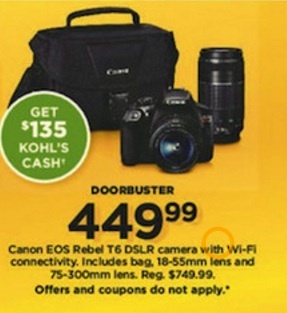 CLICK HERE to shop the Best Buy Canon deals. 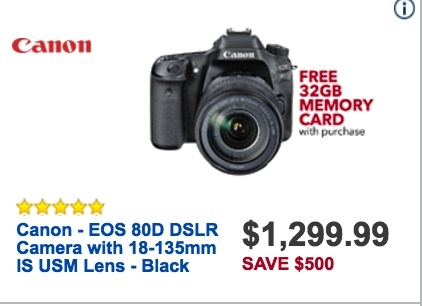 CLICK HERE to start shopping Adorama. 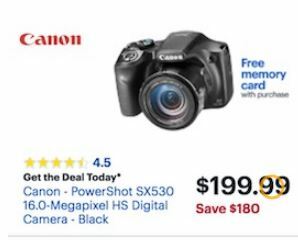 We will be adding tons of deals and discounts on Canon cameras as Black Friday 2017 approaches. 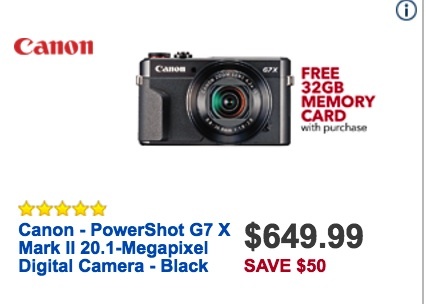 If you are looking to score big savings on a top quality camera, you will find your best options here. 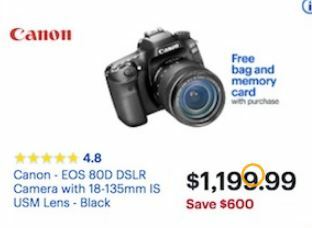 We plan to spend an enormous amount of time scouring the Canon website, Amazon and camera shop websites to bring you the very best Canon Black Friday deals. So visit us again shortly!